Having arrived on the scene in the UFC in 2013, the Irishman rapidly ascended through the featherweight division. McGregor secured the 145-pound title with the most spectacular of knockouts against former dominant champ, Jose Aldo, at UFC 194 in Dec. 2015. What was perhaps most interesting about the braggadocious Irishman was his razor-sharp wit and incredible confidence, which was compounded by his ability to belittle, antagonize and mentally short circuit opponents before fights. Aldo’s inability to respond to McGregor directly (due to him only speaking Portuguese) was argued to be one of the chief reasons for his frustration. 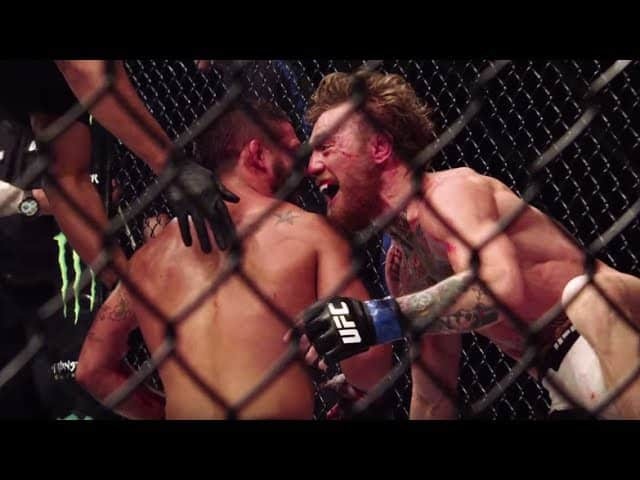 While only understanding the level of verbal brutality McGregor was aiming at him via his interpreter, Aldo was effectively undone mentality by the SBG Ireland star’s ability to get inside of his head. “The Notorious” did not reserve his verbal assaults for just his opponents, however, as he often insulted and ridiculed those in higher weight classes or some who made the mistake of challenging him. From Donald “Cowboy” Cerrone to Brock Lesnar, none were safe from the Dubliner’s insults and hilarious put downs over the past few years. McGregor as a fighter is one who approaches a bout having carefully analyzed his opponent – the Irishman adopts the same approach to his trash talking. Not only does McGregor pinpoint the potential insecurities and/or perceived weaknesses of a potential opponent when berating them, but he almost uses these as a mantra when speaking to the media. “What McGregor is attempting to do is take a page out of Floyd’s book from the marketing and promotional side by using his name. “He has a good little hand game, a superior hand game compared to the UFC fighters he is competing with but fighting Floyd Mayweather is a whole other story,” Ellerbe said. Until now, McGregor’s greatest achievement is talking his way into a boxing bout with arguably the greatest to ever do it. Should he pull off a win, then he will surely take his place among the ranks of the true icons in sporting history.